B is for Bedtime... I love books for preschoolers! You are here: Home / Things To Do With Kids (By Subject) / Kid's Learning Activities / Reading Activities / B is for Bedtime… I love books for preschoolers! 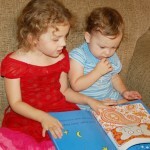 B is for Bedtime… I love books for preschoolers! This week we are having fun playing and doing things that begin with the letter B during our playtime, lots of blocks, lots of banging and bouncing, and lots of quiet-down bedtime stories! Candlewick Press must have known that this week was the letter B in our Activity-a-Day calendar as they sent us several bedtime stories I let each child pick their favorite one to share with you today. Do your kids have a favorite bedtime book? Tell me about it in the comments. My son loves this book in part because he shares a name with the author, and because the little chicken in the story interrupts his “papa” during the bedtime story and warns the storybook characters of impending demise. The little chicken stops Little Red Riding Hood from talking to the Big Bad Wolf and calms Chicken Little who is panicking about the sky falling. I thought this was a great example of problem solving and reading/story comprehension. This book inspired me to ask the kids for alternate endings to the stories they know by heart. To ask them, if they were the character in the book, what would they or should they do. Tuck Me In! by Dean Hacohen and Sherry Scharschmidt. This was a great book for my “learning to identify animals” toddler and it was also a great book for my “just starting to read” eldest. 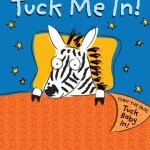 The book asks, “Who needs to be tucked in?” Then, there are a number of animals who say they are ready for bed. My toddler loved moving the page sheet to “cover” the animals. I appreciated how repetitive the words were and how most of the words were not complicated! This is a perfect book for a new reader. I loved listening to my oldest read this to my younger kiddos. Have your kids wondered what happens to the moon while they sleep? 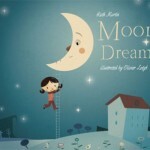 This book follows the adventures of Luna as she tries to stay awake and find out where the moon goes and why it is no longer hanging in the sky come morning. Luna ends up falling asleep each night and going on fanciful trips in her endeavor to follow the moon. It is cute! Thanks again to Candlewick Press for sending some books for my kids to enjoy! We love the Little Engine that Could at my house. The chicken book sounds wonderful. We love Goodnight Gorilla and The Runaway Bunny in our house. Chicka Chicka Boom Boom was one of my son’s favorite books when he was little. I still have that whole darned thing memorized, years later. 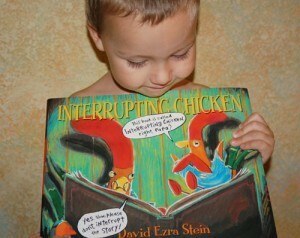 Interrupting chicken made me think of the “interrupting cow” knock-knock joke. Haha! Still laughing. My daughter loves Lama Lama Red Pajama and our Rhyming Bible. Have to check out your list!! Thanks for sharing.